Editor’s Note: Frances Shure, M.A., L.P.C., has performed an in-depth analysis addressing a key issue of our time: “Why Do Good People Become Silent—or Worse—About 9/11?” The resulting essay, being presented here as a series, is a synthesis of both academic research and clinical observations. In answering the question in the title of this essay, the two October segments — Part 10: Terror Management Theory, and Part 11: Systems Justification Theory — examined, respectively, how the fear of our own death, and the need to feel good about the cultural system in which we live, can create resistance to the evidence indicating that the official story about 9/11 is a lie. Research shows that even though the educational efforts of 9/11 skeptics may be resisted, there is a delayed impact upon the listener, resulting in later attitude shifts in favor of the facts about 9/11. 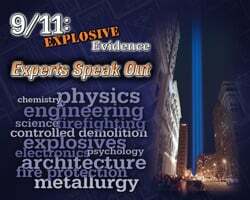 We continue Ms. Shure's analysis in November with Part 12: Signal Detection Theory, which reports on whether or not people perceive information amid external and internal distractions, and how this perception may effect their receptivity to the educational efforts of 9/11 skeptics. Nearly all human decisions are made in an environment of uncertainty. All of the stimuli, both external and internal, that create this uncertainty are called “noise.” To perceive reality accurately, we must be able to detect a “signal” amid the distracting noise. The more noise there is, the harder it is to detect the signal. Example: You are looking for a person (signal) in a crowded room. If there are 100 people (external noise) in the room, your likelihood of spotting her is much greater than if there are 1,000 people (more external noise) in the room. If you are exhausted (internal noise) or you view the person as disagreeable (internal noise), you will have a harder time finding her. How does this theory apply to why people are silent, or worse, about the information provided to them by 9/11 skeptics? 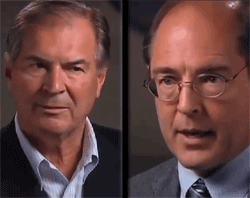 Let's assume you're a believer in the official 9/11 story. You meet a friend at a crowded party. The music is loud. 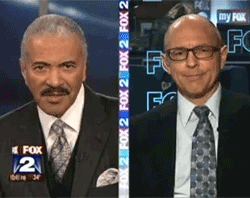 Over the din, he tells you he thinks 9/11 was a false flag operation. 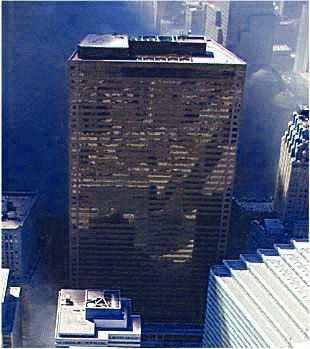 He pulls his smart phone from his pocket and shows you World Trade Center Building 7 falling into its own footprint. He tells you that 2.25 seconds of this collapse (eight floors’ worth) was at free-fall acceleration, and that this can only be explained if explosives cut through the steel columns. You like and respect this friend, so you are open to his signal. But can you hear it clearly enough to make a decision about reality? 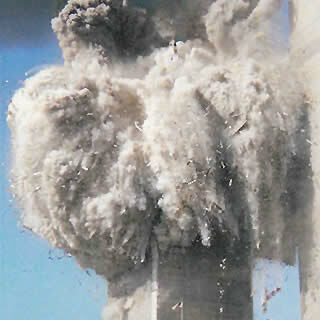 Editor's Note: Our September newsletter introduced readers to Australian 9/11 blogger Dahlia Mae Lachlan, who, in this AE911Truth article republished from her blog site GumshoeNews.com, called on Sir Isaac Newton's scientific discoveries to make the case that the three toppled towers were subjected not to gravitational collapses but to controlled demolitions. 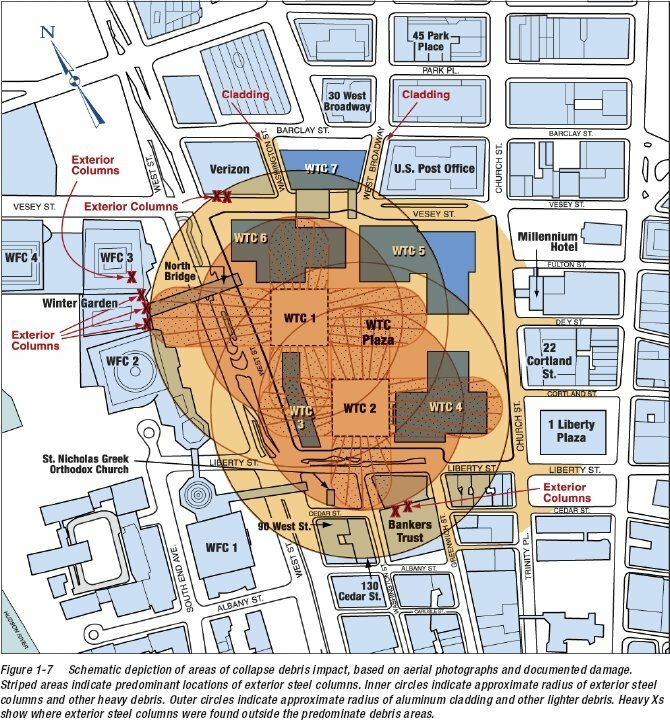 In one of her more recent blogs, Lachlan wishes she could tap the skills of a modern-day scientist — forensic anthropologist Dr. Temperance Brennan of the TV crime show "Bones" — to prove that the bone fragments found on World Trade Center neighbor Deutsche Bank in the days and years after 9/11 indicate pre-planted explosives. To see how this evidence is "the smoking gun — the bullet that blasts holes right through the official story" — read on. You know Bones — the American television crime series? It is a pity they didn't do an episode where Dr. "Bones" Brennan investigates "Cold Case — Deutsche Bank 9/11." Anyway, it would be too easily solved. 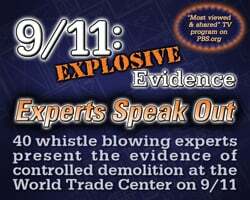 Because the abundance of bone fragments from the World Trade Center's Twin Towers on 9/11 is the smoking gun — the bullet that blasts holes right through the official story. 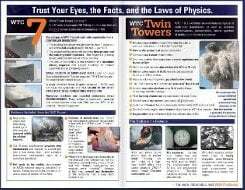 You see, just like the impossibility of Building 7 being brought down by fires — a fire has never caused the total destruction of a steel skyscraper (as discussed on ae911truth.org) — so is it equally impossible that fires and collapsing buildings have ever pulverized people like those who were killed in the Twin Towers. EVER. Those who try to confuse the 9/11 Truth Movement with bunkum about structural abnormalities, no planes, whistle-blowers on meds, or who twist words and theories to suit the official theory — go ahead. It doesn't count here. Supported by evidence of Nano-thermite, people were turned to dust — pieces 1/16-inch small, thousands of pieces — including firefighters (most likely inside stairwells). The forensic logic of the "9/11 bone fragments" is the DNA bullet in the official story, making a mockery of NIST's document. These bone fragments from the firefighters burn any official theory to ash — and make the entire concealment of all the other evidence a fraud. 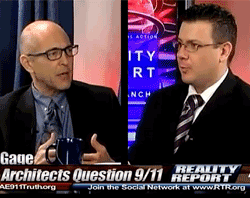 The idea of having a 9/11 Truth billboard in Times Square was once just “pie in the sky,” says Les Jamieson, New York City's point man for Architects & Engineers for 9/11 Truth. But today it’s a reality that Jamieson believes is bigger and more significant than anyone could have predicted. “It’s unbelievably dramatic when you see it and read it,” he marvels. “The whole message is powerful. 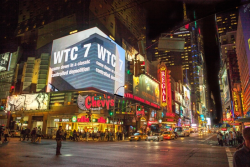 The 89-foot-wide and 45-foot-high video screen in Times Square will show passersby — both pedestrians and motorists — the 9/11 demolition of World Trade Center 7 every three minutes from now through early October. 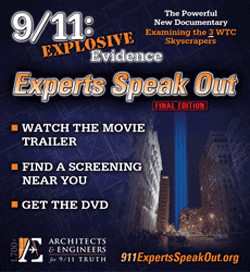 AE911Truth raised the funds from hundreds of supporters to pay for the ad space. The advertising agent estimates that 100,000 people will see it each day. That's a total of 3 million between the September 8 start date and the October 8 end date. The ambitious project is a continuation of last year's Rethink911 campaign, with its massive billboards and other public ad formats in cities all around the world. It's about being willing to step out of your safety zone and rethink how the world really works. That's the essence of David Hooper's new documentary, The Anatomy of a Great Deception, which kicked off this year's 13th anniversary commemoration of 9/11 in several cities. The film, which has the backing of Architects & Engineers for 9/11 Truth, premiered September 5 in Detroit and drew an impressive crowd of 375. Other screenings followed on or after September 11 in New York, Houston, Oakland, San Diego, and many other cities. Anatomy chronicles Hooper's personal struggle as he reconstructs a world view that had been shattered when he began to research what really happened on September 11, 2001. 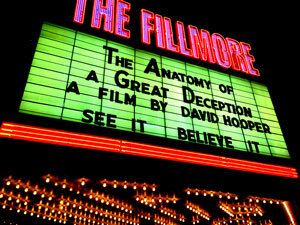 At the Detroit kick-off, Hooper and his film were introduced by AE911Truth founder Richard Gage, who described the documentary as being Hooper's journey of awakening. 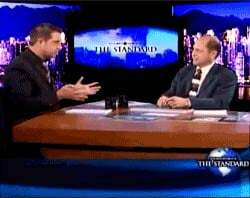 "David is a businessman-turned-filmmaker, a regular family man who unwittingly stumbles into the 9/11 debate, leading to his own investigation and to many life-changing conclusions he reached after he researched the evidence for himself," Gage noted. "I'm inspired by the open mind David exhibited in his quest for the truth when he found himself retreating behind the 'arbitrary line in the sand' that he had drawn, for his own psychological safety, in the beginning of his journey." It has been 13 years since the tragic events of September 11, 2001, spawned the rebirth of what has become America's guiding mantra — "Never Forget." But to faithfully heed its message, mustn't we, in addition to remembering the fatal day called 9/11, also remember the spheres of molten iron, the melting of steel, the free-fall of a skyscraper not hit by an airplane, and a host of other physical laws that prove the controlled demolition of the World Trade Center skyscrapers? 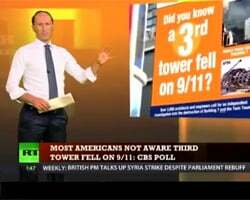 The answer to this question is where the mainstream media and the 9/11 Truth movement depart. 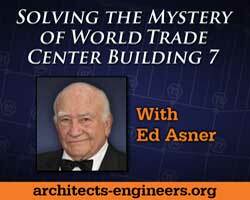 It also explains why, on the 13th anniversary of 9/11, hundreds of supporters of Architects & Engineers for 9/11 Truth descended upon the World Trade Center in New York. AE911Truth is just as at-home and productive in the streets educating New Yorkers as it is educating students and faculty in universities and building and design experts in professional settings. 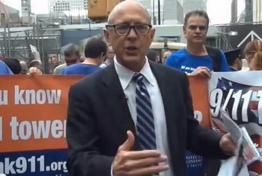 The non-profit group's three-day outreach began on Thursday morning, September 11, with a milestone press conference held at the corner of Vesey and Church right in front of the Liberty Tower. AE911Truth founder Richard Gage, AIA, opened the press conference to a dozen cameras. "We are here to tell the truth to the American people about that day, because they have not received the truth, the evidence. 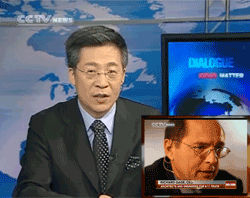 There are very serious problems with the official story, which has become the official myth." 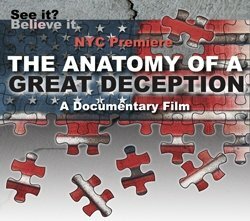 Gage proceeded to announce the upcoming New York City premiere of The Anatomy of a Great Deception and the symposium "The 9/11 Awakening Goes Mainstream," as well as the concurrent giant video billboard in Times Square. Gage highlighted the five key benefits of 9/11 Truth to the 100 or so intrigued onlookers who had gathered on the street, starting with his own personal favorite, "9/11 Truth is Good for America because it restores our country's moral foundation and our faith in government." In answering the question in the title of this essay, the August segment, Part 9, reported on the interface between brain research and the study of moral psychology, and how this research demonstrates that some moral convictions are innate and thus hardwired in the human nervous system. Additionally, we learned that some of these innate brain structures make it difficult for 9/11 Truth activists to present their evidence, as well as for listeners to receive this evidence openly. We continue Ms. Shure’s analysis in October with a dual offering — Part 10: Terror Management Theory, and Part 11: Systems Justification Theory. They examine, respectively, how the fear of our own death and the need to feel good about the cultural system in which we live create resistance to the evidence presented by 9/11 skeptics. Terror Management Theory postulates that whenever we are introduced to information that reminds us of death — such as simply the mention of 9/11 — our anxiety increases, since we are reminded of our own inevitable death. This anxiety is called “mortality salience.” Studies show that our behavior immediately becomes more defensive when we are reminded of death. In turn, we become increasingly insecure. This normally causes us to show increased preference for members of our own group (the "in group") over out-group members; to show more “consensus bias,” or favoritism toward those who hold beliefs similar to our own; and to develop “compensatory conviction,” an inflated faith in our personal worldview, such as a bias toward our own country and religion. Therefore, when we skeptics try to educate people about 9/11, we provoke anxiety in our listeners since, unconsciously, we are reminding them of their own death. More defensive behaviors then ensue. In addition, if our listeners view us as members of a minority group, they usually resist what we are saying — at least initially. If, on the other hand, they view us as members of the majority group, they are more likely to accept our information. In other words, people like to be on the winning side, or in the middle of the bell curve, as we saw in Part 6: Conformity. Are You New to the Evidence?